The PM also wished success to a delegation of officials from Nigeria who came to study the Swachh Bharat Mission to replicate it in their country. Prime Minister Narendra Modi on Tuesday highlighted the work done by his government under the Swachh Bharat Abhiyan in the last four years and unveiled or laid the foundation stones for several development projects through digital links in Haryana’s Kurukshetra. 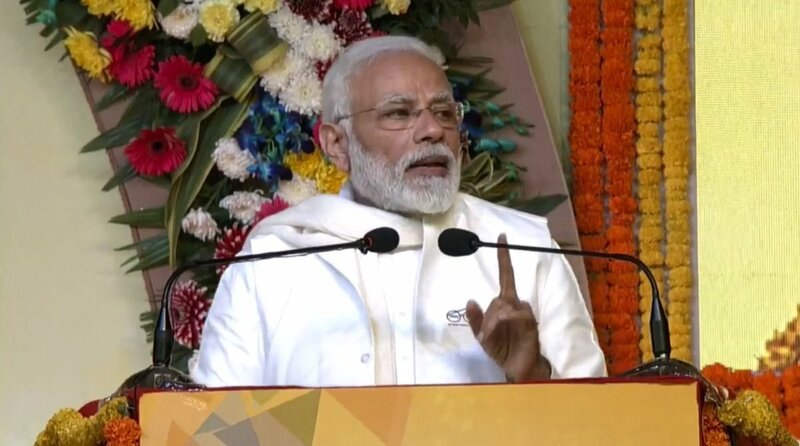 Speaking at Swachh Shakti 2019 programme, the PM said that over 10 crore toilets have been constructed in the last four years of his rule. “For about 70 years since independence, the range of cleanliness was about 40 per cent which is now 98 per cent. In the last four years, over 10 crore toilets have been constructed. Around 5.5 lakh villages in 600 districts are now free of open defecation,” he said. “Over 1.25 crore toilets were painted in a month. This is a major achievement in itself,” he said. Referring to some European cities where tourists visit to see the painted houses, the PM said that he hopes that “one day there will be a village in Hindustan where toilets and paintings on it will be so good that tourists come to see it”. The PM said that he felt pained when he learnt that girls dropped out of schools due to lack of toilets. “I took a vow to end their suffering,” he said. Praising Haryana’s progress on the empowerment of women, the PM said that the state has produced many daughters who have contributed to the development of modern India. “Women empowerment has been given priority in the last four-and-half years. A society becomes strong when women become strong,” the PM said, adding that women have become fighter pilots and are being recruited in military police for the first time in India. The Swachh Shakti-2019, a national event, was attended by around 15,000 women, including Panchs and Sarpanchs, from across the country. On the occasion, the PM also highlighted the achievements of his government in the field of healthcare. “There are today 21 AIIMS either operational or being constructed. Work on 14 of these AIIMS started after 2014,” he said.